A very popular song that has many versions and has shown up in popular culture beyond its halyard chantey roots. 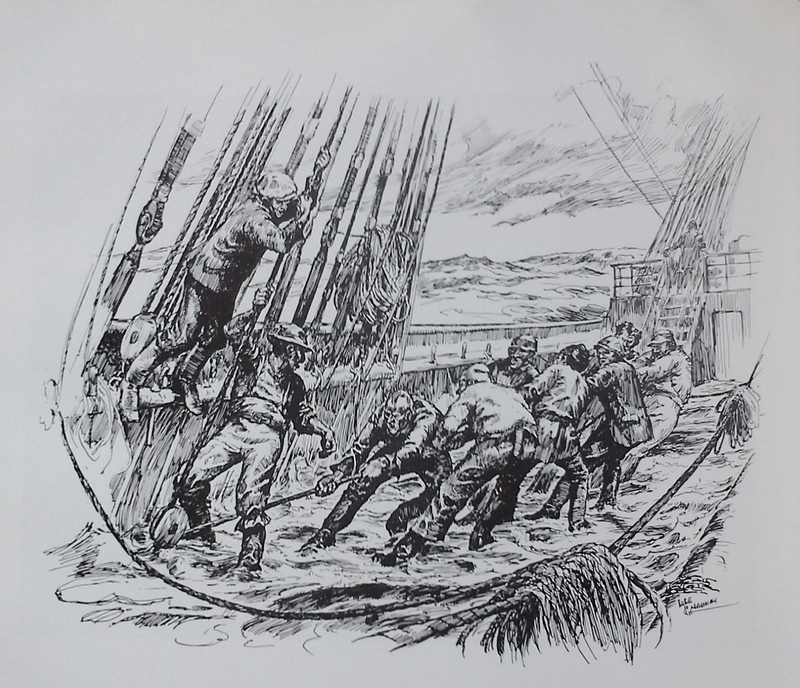 Stan Hugill states that it was used primarily for work on the halyards (“halliards”); the long, slow task of hoisting the heavy canvas sails on their yards and spars. The first version is taken from the album “Across the Western Ocean” of John Roberts and Tony Barrand. The second version I had first heard on the 1977 album “Steady as She Goes” (Louis Killen, Jeff Warner, Gerret Warner & Fud Benson), and then a longer version by Oscar Brand – after reading the various yarns and memoirs of sailors, one could easily see the less savory version being the most often sung shipboard. 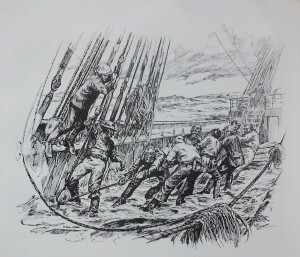 Stan points out that “to blow” here is to strike; the chief mate on Blackballer ships often referred to as the “Blower” while the second mate was called the “Striker”. Oh, give me some time to blow the man down. There’s a dandy Black Baller just ready for sea. And with that flash packet I spent my half-pay. Oh, it’s then that we went on a hell of a spree. They ship as prime seamen upon the Black Ball. For Kickin’ Jack Williams commands this Black Ball. The mate knocks you down with the end of a spar. Then it’s cruel, hard usage of every degree. With a craw of hard cases from Liverpool town. Oh gimme some time to blow the man down! She listed to starboard, I listed to port. And there on her bed I cut loose with my sword! She shouted, “My husband!” and jumped outta bed! And right for me jawbone he plotted his course. I flew down the stair like a ship on the ways! And when I awoke I was bound for Shanghai! Don’t never take heed of what fair damsels say!